Joy pumped through my veins as I galloped my Arabian mare across our pasture and through the creek. "This is the best place to be right now," I whispered to my white Arabian who I had named Destiny. I had bought her at an auction and she had been so wild so no one else could gentle her, only me. "Jessica, dinner is ready!" Amber, my little sister yelled from the house, disturbing my ride. "Coming!" I yelled. "Give me five minutes." I gently shifted my weight onto Destiny's back and whispered canter. Destiny slowed on command. "Wait a minute," I thought, "How in the world could I have heard Amber call me when I was galloping?" Then I remembered that she had a really big voice and could scream and yell really loud. We cantered up to the pasture fence and halted next to the barn gate. I hopped off and led Destiny through the gate into our barn. When I finished feeding and settling Destiny in her stall, I said, "Good night, girl." She nickered in return as I closed the barn door. I ran as fast as my legs could carry me, dodging the old lawn mowers and many other things that Dad had to fix for his clients because he was an odd-job man. Now, I had reached the backdoor of our one-storey house. "You just made it Jessica!" Amber announced as I washed my hands and sat down at the table opposite her. Dad had already started on the massive roast chicken with gravy and vegetables. My mouth all of a sudden watered. And Mom? Well, she had died in a car accident two years ago. She had been the one who had taught me everything that she knew about horses. Mom had gotten a reputation as being the best horse gentler in the whole country, but I think she was the best in the whole world! After she died, we sold our big ranch and all our horses. I stabbed a piece of chicken in my mouth. In the meantime, Amber had already started a conversation with Dad. But I am really never of any help. I woke up when the sun hadn't even had time to show it's face. It was only five in the morning and the sun was already late. I changed quickly into some jeans, boots and a faded bright green t-shirt. "It was really good that Amber had bought new t-shirts for the school year," I thought. On my way outside, I passed the kitchen. I saw that Amber must have been up really early because she had made sausage rolls but they still had a bit of warmth to them. I took two sausage rolls and a bag of treats for Destiny and stuffed the bag in my pocket. Then I headed outside while eating my early morning snack. As I neared the pasture, I heard a nicker. "Morning girl," I greeted my horse. "Wait," I thought as I swallowed the last bit of my sausage rolls, "I put Destiny in the barn but the nicker came from the pasture," I muttered. I ran the rest of the way to the fence. It was not Destiny I found but a paint horse! "What?" I gasped, "How did you get in there?" I asked the paint. I studied the paint a little bit more. He was a little bit more smaller than Destiny. He only had a dirty coat but I could still see that he was a paint. "So you must have run away?" I came to the conclusion. Destiny's nicker brought me back to the present. "Coming girl!" I told her and dashed into the barn and grabbed a lead rope, a halter and a bucket of oats for the paint. But before I did, I gave her one of Amber's horsey treats. "School starts tomorrow so I might be able to find out whose horse this is." I planned while I walked to the pasture fence and ducked through the railings. "It's OK, boy." I said quietly as I walked a few meters towards him. He stood under the oak tree looking with fear and confusion in his eyes. I could see it. His fear won him over and he bolted and galloped around the pasture doing massive circles around me. But as soon as he saw that I was just standing there and not doing anything that was going to harm him, he slowed down to a canter then a trot, a walk, and finally a halt. We just stood there for a good five minutes looking at each other. Me, planning what to do next with him. And the Paint? He was most likely deciding what to do with me. I put down a bucket of oats at my feet. He takes a step forward. He kept on going until he was right in front of the bucket. He lowers his head to eat the small amount of oats in the black feed bucket. He lifted his head looking around for more. "Sorry boy." I said as I turned my back to him. I lifted my arms to be horizontal with my shoulders (like a 'T' shape). I started walking towards the barn. Soon I heard a soft thump-thud, thump-thud. My heart rejoiced but I didn't turn around. We continued until I reached the pasture fence. "Good boy!" I praised him and gave him a treat. Then I remembered the lead rope and halter that I had left next to the black bucket in the middle of the pasture. "Stay here, buddy." I told the Paint as I jogged to the bucket. But I didn't need to worry because he dropped his head to graze. 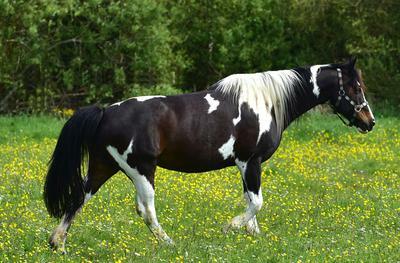 Half an hour later, I had gotten Destiny and the paint together in the pasture. She kicked up a bit of a fuss though, but she seemed to have settled down already. I still had to do my barn chores so I set out to work. Soon, I had finished and looked around with a satisfied smile. Then I walked up to breakfast. "So Jessica what have you been doing up so early?" Amber asked as I sat down at the table. "She must have seen me and I didn't see her." I thought. "Oh, well I found another horse in our pasture!" I said hoping like it happened every day. Amber's spoon clattered to the ground. "What did you just say Jess?" She asked with her mouth open wide. "Did you just say that there is another horse besides Destiny in the pasture?" Dad asked with the same reaction as Amber's. "Yeah Dad, it's a paint gelding. I also already decided that I might be able to find his owner at school tomorrow." I said hoping that it sounded like a good idea. "Yeah OK, but I want to see it straight after breakfast," Dad said. "Him." I corrected. "But I also need to go to the feed store," I said trying to make an excuse. "But I thought the hay man was coming today?" Amber said wanting to take part in the conversation. "Yeah, that's right. But I need a few other things." I explained. "OK, I can take you but I'm going to see this horse first," Dad said and the tone of his voice said that it was final. "So Dad, are you going to look a the paint?" I asked him as he entered the garage. "Oh, sure I forgot about that!" We both walked down to the barn in silence. As we neared the fence, we saw the horses cantering around the pasture with their tails up high like flags of freedom, heads up high and a sparkle of excitement in their eyes. I sighed a sigh of relief. it was really good that the paint was making a good impression on him. It almost looked like they were cantering in slow motion. "So Dad, can we please go to the feed store?" I asked after a few minutes of watching the horses. "I'll see you when you get home!" Dad said cheerily as I loaded the pellets up in the truck. "OK, thanks Dad!" I shouted above the roar of the engine of our cattle truck. I mounted my bike and we rode off in different directions. I was off to my job. 2. to earn money to keep Destiny in feed. "What are you doing here?" Lissara frowned at me as I walked out of the posh tack room at the 'Collin's Stables'. She always reminded me of a fox with her red hair and green eyes. "What do you think? I'm here to muck out stalls?" I snapped as I picked up the pitchfork and dumped it in the wheelbarrow. "But you were meant to come at 6am not nine." Lissara challenged me. But I was ready for it. "Your brother told me to come at nine," I said through gritted teeth. I wished that she would go away. I started on the first stall. Lucky for me, Lissara got bored of me and went to see a friend. "Lissara would probably be in a few of my classes when I started school here," I thought as I shoveled some more manure. It took me about 1 1/2 hours to clean all the stalls. But I didn't mind that much because I got paid for it. Suddenly, I remembered that I had to go to the stable office to see Mr. Collin as I would only be able to muck out stalls in the afternoon after school. "Good morning, Mr. Collin." I said in my best job voice as I entered the stable office. "Hello Jessica, how may I help you?" Mr. Collin's voice came from behind the desk. "Um, I came to ask If I could only work in the afternoons?" I said as I took a step forward. Mr. Collin's head looked at me over the top of the desk. "But I will still do all the stalls," I assured him. Mr. Collin frowned, "OK, then. But you must be here 3:30 sharp," he said in a strict tone. "Every after noon on weekdays, like it's always been," he added. "Thank you very much! That will fit into my schedule perfectly!" I smiled. Final update! Writing is wrapped! Yes! The shorter of the two growled and cursed at me. Mr. Lake kicked him hard in the ribs with his boots, that much to my liking were black riding ones. In the end, they confessed that Mr. Wilson was their leader and that they were going to drug Sunny's horse. It wasn't much of a detective case but we sure would have many more and better ones in the future. The next day, I received a voicemail from someone called "unknown". The sender growled, "I'm not done with you yet!" "Sorry to disturb sir, but I had a missed call from you?" "Yeah, I'm not done with you yet!" He snarled cruelly. "Good luck with that smarty!!!" I smiled cheekily and hung up on him. You probably are wondering what happened to Ginger and Sunny. Well, they went on to win the Rodeo and to beat the old rascal's (Mr. Wilson) horse, White Lightning and their story will continue in the next chapter. Part 17 is out! I'm really sorry for the late update. By the time I turned around and finished brushing my light blue denim jeans off, the two officers had our two horse druggers plopped on the ground like dolls sitting in a shop window waiting to be sold. The male cop nodded for me to start the questioning. "So," I kept a serious face, "What's the point of sneaking into a private barn at night?" "We came to meet someone here," was the lame excuse from the taller of the two. "Ya know, that's not going to make us let you go away." I leaned closer and narrowed my determined brown eyes from my sitting-on-the-knees position. "Who is your leader?" I tried yet again but their lips didn't move a single bit to give an answer that I could bet my bottom dollar that it would be a lie. "Well, we'll have to do this the hard way." I leaned back on my heels and stood up. She brought out my laptop where we had stored all of the evidence. But for safety measures we had the videos etc. stored on Felicity's, Charlotte's, dad's and Mr. Lakes' (the male officer) laptops or computers. Charlotte clicked on the first clip. The horse druggers' faces turned starkly white but they didn't dare to say a word in fear of landing on the unpleasant side of Mr. Wilson. "As you have seen, we have more than enough evidence to land your whole gang in prison." I showed a little hint of a smirk on my lips. Just to let you horse girls know that I have renamed the series that this book is in to, "The Horse Whisperer". Book two of this series will be called Answered Prayers. Hey! Thanks so much! It really encourages me. I wanted to change my name on here to Arabian Girl but I thought it would be best to leave it as "Hoofbeats". Hoofbeats, I can't wait until the next chapter comes out. Right now I am in suspense, it is so good. I love it! Please write more, Hoofbeats! So far it's super good, and exciting! Keep it up! Wind howled around the barn like it wanted to destroy it as Felicity, Charlotte and 2 police cops crouched in the stall closest to the tack room. I knelt down in my shadowy hiding spot in the stall closest to the barn doors. This was it! Right up till now our plans had gone pretty good. We had showed the police our evidence and they sent two police officers – one male and one female – to make sure everything went fine. For safety, I had been allowed to transport my horses - all except Black - over to Charlotte’s house. Felicity also donated four of her big plastic horse models, that she used to display rugs in her shop, to make it look like there were real horses in the stalls. On top of that, we had set up about half a dozen cameras to record any evidence that we could possibly get our hands on. Suddenly the barn door creaked open, two men clad in dark clothing stood out like sore thumbs against the midnight mist. They crept into the barn keeping close to the right side of the barn aisle. One of them stepped into Ginger’s stall as he reached his hand into his pocket for what I guessed would be drugs. I strained my ears to hear the signal. There it was! It was the sound of a horse shuffling in its stall — but it really was Charlotte. I silently tip-toed out of the stall to the barn doors. While the criminals busied themselves, I silently pulled the barn doors shut and bolting it. Now all I had to do was reach for the light switch to turn on the lights. I stretched my arm into the darkness. Where was it? Suddenly I stretched too far, losing my balance and tumbling onto the floor. The two men turned, switching on their flashlight which cast its light beams right on me like a center stage spotlight. All of a sudden the flashlight dropped to the floor followed by a heavy thud. For a few seconds there were heavy grunts and thuds. In the meantime, I had enough sense to once again get up and reach for the light switch. This time I found the switch with no problem, I flicked it. Thanks for reading! I hope you like it. By the way, I have two more parts to post to finish the story so I hope to have them out soon. Loved the double update. ;) Can't wait to see what happens next! "Well... I do offer lessons for $30 on Tuesdays, Wednesdays and Thursdays," I said trying to sound business like. "Really? I’ll give you my e-mail address and then you can send me all the details," was the enthusiastic answer. So in the end, Karen introduced me to her three children and I helped them with finding some new riding clothes around the saddlery. After they left, I told Felicity that I would be quitting my job at the Collins Stables because I now had students and I knew that I was going to quit at the Collins Stables sooner or later. Much to my surprise, Mr. Collin had already three new workers and I left my phone number with him because he said he might need me to train a horse or two in the future, and for some reason he was in a strangely happy and enthusiastic mood. After that, Felicity started shutting up the shop and during that time I told her the worrying news about the two men. "Are you sure?" She asked in doubt. "Yes Felicity, I’m very sure!" I pressed. "Wait! you have security cameras don’t you?" Hope filled my voice. We went to check out what the cameras had seen. Sure enough, it showed clear footage what the men had done. We both agreed that we would meet at my house with Charlotte for dinner so we could discuss what we would do. What I loved about Felicity is that she was more than happy to help with this detective work and that she gave me a job without any problem. She was almost like a mum... almost. Thinking of mothers reminded me of my mum and it brought tears, once again in my eyes. When I got home, I e-mailed Mrs. McCarthy with all the details and when I could give riding lessons, which would be in the afternoons. She replied to my e-mail almost instantly, saying that her youngest daughter would ride twice a week, with her and that her son and oldest daughter would ride once a week for now. Harry (that’s the boy’s name) wanted to continue to learn how to ride western so I e-mailed Sunny to see if she would let me use Ginger in lessons and I gave her a discount on her weekly barn fee if she accepted... and she did! I hope this e-mail finds you well. Here are the details for the lessons. If you are happy with these times please let me know and please feel free to change them. If you ever need to cancel a lesson it with be $10 cancelation fee if you cannot find a makeup lesson in three days time. But when I sat down for dinner dad had more news for me... well us, Amber and me. "Girls, I have decided that you two will be starting homeschooling!" He exclaimed. "Are you kidding, Dad? That’s just awesome!" I almost shouted with enthusiasm. "And the Whitney family will be starting next week with it and since Anne (Charlotte's mum, by the way) is a teacher she offered that you and her kids do school together in their new schooling room." Dad continued. We had done homeschooling before mum died and Amber and I really enjoyed it but when mum passed away it got too expensive so we had to go to public school. "Hey dad... good news! Today I got a job at Silver Creek Pet Haven and I also have four new horse riding students and I am offering lessons for $30 each." I told him my news excitedly. "Hey that’s awesome!" Dad and Amber said in unison. I also told him that Felicity and Charlotte were going to come over for dinner the next day but I had planned to have a picnic with both of them near Bracken Creek –which is on our property. According to my plans, he agreed and after dinner I headed up to my room to plan what the picnic would be like. I grabbed a notepad and pen and raced down to the barn to feed the horses. Soon, I plopped down in the pasture with Destiny, Ginger and Ivy as they grazed. The warm early autumn evening air engulfed me and rustled through my long waist-length dark brown hair as I sat watching the horses. The wind blew in the leaves of the magnificent oaks, the beautiful Liquid Ambers and the colour changing maple trees. The silvery moon sat in the sky casting its moonbeams among the trees. I smiled at all the beauty that God had made for us to enjoy. Now, I focused on planning how the picnic would be. I loved making lists, lists about anything, horse names, quotes, websites, you name it. Take the horses. Felicity can ride Ivy, I will ride Destiny and Charlotte can ride Ginger or Freedom. With that, I finished. You might think it’s stupid for me to write down stuff like that that but I liked it. That story is amazing, can't wait for another part! After school, I rushed into The Pet Haven to start my job. The Pet Haven not only was a pet store but also a saddlery. A wall with a big square archway separated the saddlery part of the store from the pet shop part of the store. When I arrived, I discovered that Felicity already had my uniform ready. The shirt was simply a blue and white polo shirt with a pair of jeans. But she also said that I could wear anything I wanted as long as it was appropriate. After doing my shift for about an hour, both Felicity and I went out into the storeroom to get more helmets in and stack them on the shelves. All of a sudden, I felt like getting a drink and I hurried to the hook where I kept my bag. But two men walked through the store door while holding the bell so we would not hear them come in. My suspicion alarm told me to scoot into a dark corner where I could still hear and see them but they couldn’t see me. "White lightning HAS to win..." One guy said in a low voice. "Hey, here’s the plan," said the other guy, looking around making sure that there were no people around. "I’ve heard that Sunny Matthews horse is being trained by a girl called Jessica Hamilton." Are you kidding me? My brain squawked. How did they get all that information? "We’ll drug Sunny's horse on Thursday night so then they will think that she will not be able to enter the rodeo this Saturday and then we can both go on Friday night to drug her in case they don’t scrap her! This HAS to work or my name isn’t Wilson!" The man’s word dug deep. I felt like shouting: You aren’t going to get away with this! But I had a great plan, I just needed Charlotte and inspiration from home alone 1,2 and 3! All of a sudden, Felicity came in from the back storeroom and the two men turned to make it look like they were looking through the riding coats. "Oh sorry, I didn’t hear you come in, may I help you with anything?" Felicity said dumping the boxes with the helmets on the ground behind the check out. "Oh no, thank you ma’am, We’re just having a look." One of them said trying to sound casual. I wanted to stretch my legs but my legs felt so cramped that I would have made a big noise trying to get up. Finally, the men left after buying lead ropes and halters so I scooted out of my hiding spot. I wanted so much to tell Felicity what just had happened but a family of five clambered through the door. Since I was standing at the checkout the Mum came over to me while her three kids and husband looked around the saddlery part of the store. "Hi! My name is Karen McCarthy and my three children would like to start horse riding lessons. Their old riding school was shut down so I am on the lookout for a new riding instructor." She introduced herself. I smiled politely all of a sudden getting an awesome idea. On Sunday we always went to church, my most FAVOURITE day in the whole week. Our pastor gave a sermon about compassion and I wrote as much as I could down. I peddled as fast as I could to the shop that I called the feed store. But it really was called Silver Creek Pet Haven. I jammed so hard on the brakes that I skidded to a stop right in front of the pet haven. Right where I wanted to be, I chained my bike to the nearest lamp- post and stepped up the two steps and pushed the door open with my shoulder. This was where I bought Destiny’s feed-and now Ivy’s, Black’s and Ginger’s feeds-and so many other things that I usually needed. I walked up to the counter and Felicity looked at me over the shop’s only computer. "G’Day Jess!" She greeted me with Aussie slang. "G’day Felicity!" I returned the greeting, "I was wondering if you have any job offers come in from one of you customers?" I asked hopefully. "Whose it for?" She asked curiously. "For me. I got two new horses, you see, and dad said I can keep them as long as I could earn enough money to keep them." I said surprised at myself for giving so much information. "Well as a matter of fact," she said with a mischievous grin, "I wanted for a long time to employ you. You seem to be a very honest, diligent young worker." The words rung in my ears for a few seconds and then I blushed as I realized that the words of praise were meant for me. "Hey, well thanks Felicity so when do I have a trial day?" "Trial day? You don’t need one! If you like you can start today after school. Just please sit down," she said motioning to one of the two seats that stood beside the desk, "And I’ll get a name tag printed for you. I’ll also have a uniform ready by the time you get here from school." Suddenly I remembered something, the mucking at the Collins stables! "Felicity?" I asked, "I still have a job at the Collin's stables so I need to move my shifts to the morning." But she had it all sorted out, or more like God had. "Well maybe you could work for me on Saturdays, Mondays and Fridays. Then you could leave your shifts for Mr. Collin in the afternoons and work in the mornings on those days for me." "Nice idea," I said to my new boss, "But I think I will ask Mr. Collin for me to only work for him on Tuesdays, Wednesdays and Thursdays. And then he will have to hire someone else to do the stalls on other days." I finished, out of breath. "Fine with me!" She smiled. I talked a bit more with her and then I arranged it with Mr. Collin for my new shifts. In fact, he was so desperate for a new mucker-and to keep me from quitting-he doubled the amount of money I got for mucking for him and he asked me to post an add on my website and in Felicity’s store so he could get a second mucker ASAP. God really blesses us, even if we don’t feel like we deserve it! Hi horse girls! I'm sorry to say that The Wild Flame will most likely be only coming out in August this year. I will post part one here if you really want to (to get you even more excited). I will do my very best that the wait will be made up by making the story the best I can! Please comment, and please enjoy. Hoofbeats, I can not wait until you submit that new story you're writing!! It sounds so good. And I know it will because Runaway was so good too. Hi horse girls! I am so excited to say that I will be writing another story (of course I will continue Runaway)! It will be called, The Wild Flame and Paruku Island. I wrote a teaser for it to get you girls craving for it! LOL! Fourteen year-old Lisa Hardy is a soul survivor of a devastating shipwreck. Trapped on a desert island, Lisa find her only companion is a horse, or is Lisa and the horse the only one? He is beautiful, unbroken and savage... a horse whose beauty matches perfectly his wild spirit. Join Lisa and the wild stallion on a journey that will change their lives forever! My story will be submitted on this website within the next few weeks! Please tell me what you think and be looking forward to another horse-crazy and dangerous story! Suddenly, as we drove home, a scripture popped into my mind that I had read that morning: "Cast thy burden upon the LORD, and he shall sustain thee: he shall never suffer the righteous to be moved." "God, thanks for reminding me about that scripture. I pray that Dad will accept that I bought two horses today and that I will keep them. I know that you will help me, no matter what. Amen!" I prayed in my head. Suddenly peace and joy swept through my heart like a big wave washing away all doubt and fear. A few minutes later we turned into my driveway. The black gelding was so scared and untrusting that he bolted for the pasture next to Destiny's. The mare, well she was the total opposite. She calmly walked down the ramp and settled quickly into a stall. I soon said goodbye to Charlotte and her mum and they drove home. Now I had time so I was going to groom the mare. So, I hurried to her stall and started grooming her with a spare grooming kit that I had. "Ummm Jess?" Dad's voice interrupted my grooming. "Yes," I nervously stepped out of the mare's stall to face my dad. "God, please take care of this!" I prayed silently. "Why in the world did you buy two new horses at the auction?" His tone was unimpressed. "Errrr, look dad. I had the money and who knows where they would have gone and how they would have been treated?" I informed him, "I could even offer to give riding lessons on her," I said pointing to the mare with the curry comb and my hand on my hip. "Also on the black gelding when I have gentled him." I tried to make it sound like it was the best idea in the world. "It's your choice. I will let you have them and Destiny, IF you earn enough money to keep them ALL in feed, etc." He said using a stern tone of voice. Wow, thank you Jesus! I praised. "Sure, thanks dad!" I hugged him. I got back to grooming the mare while I thought of names for her. All of a sudden her coat colour started to show through the brown, thick and caked mud. I gasped. It looked like she was going to be a palomino! I spent another hour grooming her, making sure that she was all clean just to show dad that what I had got was worth my money. She had a beautiful long blaze that half covered her right eye and a sock on her back left leg. I could see her ribs so she needed a bit of extra feed. "You know what?" I said stepping back to admire her, "I think I should call you Ivy. I reckon that it would suit you perfectly!" I smiled. I couldn't hold myself back any longer, I tacked her up in some tack that Charlotte had given me and lead her to the arena. "Good girl!" I praised her as I trotted over some trot poles. I turned her towards the few jumps that I had set up. Three of them were about 90cm high and the other two stood at around 70cm high. She cleared all these except one of the 90cm jumps. We rode for about an hour and then I un-tacked her and went out to see the black horse. "Right now I'll just call you: black." I said partly to him and mostly to myself. I tried to see if he would let me near him but he wouldn't so I left a trail of treats to the pasture gate and chucked some hay for his dinner into his pasture. After, I fed the other horses and let Ginger, Destiny and Ivy into one pasture together. That was awesome! I am in suspense on what God's miracle is. Please write more soon. I love it. Soon we got to the auction. It was held at a massive, posh stable, like the Collins. We got a bidding paddle with the number 62 (my lucky/favourite number) and a catalogue of all the horses being sold. I handed the catalogue to Charlotte to look at and circle the most abused looking ones and we went and had a look at them. "We need to buy this one for the rescue," Charlotte's mum, Anne, said as we studied a dirty, poor looking chestnut gelding standing in a well kept stall. While I stood outside the stall, my eyes landed on a muddy mare in the next stall. In fact she was so dirty I couldn't even see her coat colour. I didn't even need to study her even more, I had made up my mind. I was going to do whatever I could to buy this mare, even if it meant spending the whole $900 I had brought along. "I'm going to buy this horse!" I said with determination as I stuck my head into the stall where Anne and Charlotte were still in. "Told ya!" Charlotte said with a satisfied smile on her face, "I told you that you should take some money!" Actually it wasn't just some, it was $900! After we looked at five other horses (yeah and I decided I would buy another horse, this time a black gelding), we headed to the bidding ring. Just then the Chestnut gelding was being led into the ring. Anne ended up with him by bidding $200 for him. Soon the mare-who I couldn't see her coat colour-came on. My hand shot up in the air with the bidding paddle. "$250!" I shouted, everybody except Anne and Charlotte looked at me in surprise. There was a moment of silence around the ring. "Sold!" boomed the announcer's voice over the microphones. Later, I ended up with the Black gelding by bidding on it for $400. It took us 45 minutes to load the horses into the truck. In total-including my new horses-we had five horses. Only when we drove home, did the worrying part of my brain start to worry. What would dad say when I came home with TWO new horses? How would I earn enough money to keep four horses-including Ginger? How would I find a new job? I surely needed a new one, and fast, too. But little did I know that God was about to work some amazing miracles in my life. Thanks guys for reading! I hope you enjoyed this! Please tell me what you think. Also Slorider: This story is inspired by Winnie the horse gentler! Note for all: This book is part of my series called, The Hardy Girls. I sure have Slorider! I have only read books 1, 3 and 7 of the Winnie the horse gentler series but I hope to get/borrow some more soon! Hey, have you ever read the Winnie the Horse Gentler series? I love it hoofbeats. Please write more soon. Part 9: Take some money! "Hello?" a female voice came through the phone to my ear. "Um, Hi, this is Jessica Hamilton, could I please speck to Sunny Matthews?" I started. "Sunny? Oh sure!" The phone clunked and clunked again about 30 seconds later. "Hey! This is Sunny Matthews specking, how may I help you?" A girl about my age spoke. "Hi, I'm Jessica Hamilton and Charlotte Witney said you were looking for someone to gentle Ginger," I continued nervously. "Oh right! Charlotte recommended you!" Sunny continued. "Hey, when can I bring Ginger over? Tomorrow at 11:00? That would suit me." She rushed on. "Oh yeah, um sure." I tried to sound business-like and surprised for how quick Sunny was making this work. Amber signaled that dinner was ready so I confirmed with Sunny and said goodbye. Soon after dinner, Charlotte rang and asked if I had time at 12:00 the next day to go with her to an auction. "Be warned," she said, "take some money with you, you are going to be tempted to buy one or two horses!" I hoped that would not be the case, I would possibly need to find a new job to earn more money if I had more horses. I looked at the clock, 11:00 on the dot. Suddenly, I heard a horse truck rattling down the driveway. I toss the grooming brush in a box and walk out to greet my customers. "Hey, good morning!" Sunny greeted me as her mum backed up the truck to the pasture gate that was open. I returned the greeting. Not even five minutes later Mrs. Matthews was trying... yeah, trying to unload Ginger. All of a sudden she freaked out and bolted for the pasture. "Wow, she's beautiful!" I commented as Ginger cantered around the pasture. (Note: Destiny was in the barn and I have different pastures). Destiny neighed sensing that there was a new horse... in the pasture next the HERS. But she settled down when Ginger gave a friendly neigh. With that done, my new customers left Ginger in my care for now. Not even an hour later I was sitting in The Witney's family horse truck. Everyone but us seemed to have a horse truck in Silver Creek, everyone but me. I was on my way with Charlotte and her mum to the auction and I had taken heed to Charlotte's words: Take some money! Please comment! The next part will be called: Black and Gold, little did I know. "Jess, Charlotte's here!" Amber yelled from the back door. It was now two weeks since I had met her. Charlotte lived on an animal rescue and she did the main horse work there, her older brother, Jim took care of the cat rescues and her younger sister, Tilly did the job of looking after the dog rescues. And Apparently Tilly and Amber were the best of friends. "Hey Jess!" Charlotte's voice came from the barn door. I tossed the grooming brush in to the bucket and slipped out of Destiny's stall. She jumped off Freedom's back and removed the saddle. "What brings you here?" I asked, brushing my sweaty hands on my jeans. "I have a problem horse for you to gentle." She started, "She's Sunny Matthew's barrel racing horse." Charlotte said as she put her saddle on a stall door, and sat crossed-legged on the floor. "Sure just give me her phone number and I'll ring her tonight." I quickly shot up a thank you prayer to God for this. After a quick shower, when Charlotte had left, I logged onto Amber's and my lap top and had a look at the animal help line. There were only two for me, the rest for Charlotte's family. After I answered the questions, I looked at the time--5:55 "Soon dinner." I thought, switching off the laptop. Please comment to open part 9! Little does Jessica know that taking Ginger in, will take all her and Charlotte's detective skills to the limit! This is really interesting so far, keep up the good work! "Why don't we try in the pasture?" I suggested, trying to ignore those horrible thoughts bombarding in my mind. "Good idea," was the only answer I got. When that didn't work, we started searching the whole pasture. "Shhhhh," was the only answer. My new friend broke into a run, followed closely by me. We suddenly came to a clearing between the trees, we both jolted to a stop and gasped. There was Freedom and Destiny in a ray of sunlight, grooming each other. "Freedom!" My friend yelled in complete happiness. I to ran to my horse in relief. "You know, I first decided not to trust you when we couldn't find them in the barn but now I know you were right all along." Charlotte said after a few minutes of hugging our horses. "I know you were right all along..." My mind played. Silently, I sent up a thank you pray to God for this. Soon, we rode back to my barn in the beautiful Australian the sunset. On the way, we chatted and planned to meet the following day after school. Now it really seemed that God had answered a prayer, to have a horse crazy friend live in Silver Creek! Thanks for your comments! Please comment because if you don't then I always think that nobody is reading it. I found an empty table in the lunch area, in fact the ONLY empty table. But I thought, "who cares?" But not even five minutes later, I heard a slightly familiar voice saying, "Excuse me." I looked up to find Charlotte standing there. "Yeah?" I said, blinking (not sure what else to say). She helped herself to the chair opposite me. "Okay," she started, "You seem to be the only horse person in the whole of Silver Creek." She pointed to my horse shirt (that's our town's name by the way.) "And I was wondering, if you have seen this horse...?" She pulled a picture from her pocket. I studied the crumpled photo and gasped, "No way!" It was a picture of that paint horse! And he was in MY barn! "You seen him?" Charlotte said looking desperate. "Seen him?" I cried which made half of the people in the lunch area turn to look at us. "He's at my place right now!" I exclaimed. "Awesome! Can I please get him after school?" Relief flooded her face. "Wait! Is he your horse?" I questioned. "A'course he is!" Charlotte explained, using Aussie slang. The rest of my school day ended in complete happiness. And then after, I offered her to walk home with me. Soon we reached my barn, I flung back the doors and we ran inside. "Freedom?" Charlotte shouted (that's her horse's name) but there was no nicker in welcome. My blood turned to ice, "Where is he?" I panicked. Please comment to unlock part 7! This will get really exciting! Thanks for reading. I really think you should! There are a lot of horse crazy people on Wattpad, I do know, so a lot of people would read it. "Jessica, Dad is going to drive us to school!" Amber yelled from the kitchen. I was in Amber's and my room. Well, we shared one but it was divided into two parts by a long shelf. My room was overflowing with horse magazines and the pictures on my walls were cut out of horse catalogues or calendars. Amber's room was the total opposite. Hers was so neat and everything in it matched color-wise. But I liked looking at the horse photos on my wall in the evening or when the early rays of sunlight flooded my room. I grabbed my backpack and dashed out of the house. I jumped into the truck and slammed the door. Amber and Dad were talking about dogs. She loves dogs maybe as much as I love horses. Apparently she was thinking of getting one or two. But before I knew it, Dad was saying, "Have a great day! And I hope you find some new friends!" "Yeah, well Dad could hope while I would go through all the trouble!" I muttered to myself. We had pulled up in the school car park. So we hopped out. I didn't know where to go and where to start. So I made my way to my locker. The number was 62. My lucky number. Maybe it would turn out to be a good day after all. Soon, I found my locker and that I had an English class up first. A few minutes later, the bell rang and I soon found my class and a desk. Our teacher was a middle-sized woman with her hair tied back into a ponytail. She wore a brown suit with matching pants and shoes. "Good morning everyone!" Miss Sargison started welcomingly. "First we will start with introductions." I looked around. There were another five new people besides me including a blond-haired girl who sat next to me and I hadn't noticed. Miss Sargison pointed to the girl next to me. "My name is Charlotte. My birthday is on the 26th of March." She introduced herself confidently. Then it was my turn. "Hi! My name is Jessica and my birthday is on the 1st of August." I said trying to sound confident. "Good job!" That Charlotte girl whispered to me. I was astounded. Finally, the lesson came to an end. As I headed out the door Charlotte said, "I'll see you at lunch!" and then we went our ways. I went through my morning classes astounded by what had happened to me. I kept on wondering: what did Charlotte want? Did she want a friend too? Thanks so much for reading! Sorry that it took so long for me to post this! Comment to unlock part 6! This story is part of my series called: The Hardy Girls! I turned over in my bed to face my beeping clock. I pressed the 'snooze' button and looked at the time. My sleepy brain started to switch on. I wondered how tired I had been to just set my alarm clock. Even though I was a bit early, I still got changed into barn clothes but I would change before I went to school. I walked to the kitchen. Amber was already there and making an apple pie for breakfast. "Good morning, Jessica." Amber greeted me. "Jess, you're not going to wear THOSE clothes for school are you?" She asked in a horrified tone. "No, of course not! I'm going to the barn." I snapped like I did when I was tired. "Oh yeah, I'm sorry I forgot." She appologised. After talking a bit more with Amber, I headed down to the barn. I checked the pasture to see if there were any runaway horses there. Luckily, there were none. I flung the barn doors open, sunlight flooded everything around me. Destiny nickered me a good morning. The Paint looked at me without fear, over his stall door. And I was breathing deeply and taking in the scent of the fresh hay and the horses. "This. Is. Awesome." I said to myself. Suddenly, I felt so lucky to have a horse of my own and to see and smell this every morning. "Good Morning, Destiny." I greeted my horse. She seemed a bit puzzled to see me this early, but still happy. I started on my barn chores. Then, I gave Destiny a wash because when we were on our trail ride, we rode through small creeks, puddles and sometimes a bit of mud. Those were the results from the heavy rains from last week. So Destiny had muddy legs which I was not able to clean after our ride. After Destiny's wash, I dried her and gave her a long groom then I headed up to breakfast. "I'm so excited that we're going to start school here!" Amber exclaimed as I poured myself a glass of milk and sat down at the table. "What about you Jessica?" She asked turning to me. "I'm not sure." I muttered. Dad's head shot up from behind his newspaper. "Jessica Hamilton, you will not talk like that!" Dad said in an stern tone and I knew I shouldn't talk back. "When you come home from school, I want to hear that you have at least one new friend," he continued. "Yes, Dad." I said trying not to mutter. I was 99.9% sure that I would not have a new friend in ONE day, on the FIRST day of school. But still, God could lead me to a new friend and possibly the Paint's owner. Thanks so much! I really wanted to write a story and thanks to yours, I was inspired to write this! Did you want part 4? Hey horse friends! I just wanted to say that if you have written a story on this website, I would love to read it! Just tell me the title of your story. As I rode down our street to our house, I see that the hay man was already at the barn. So I peddled faster. "Good morning, Jessica!" he greeted me. "Morning Tom. Sorry, that I'm late," I greeted him and apologized. Tom was a well-fed middle-aged man. man. What I really like about him was that no matter how cold or hot or whatever he was always in for a good laugh. "Say where did ya get that Paint from?" Tom asked. "Well, to be honest I found him in the pasture early this morning!" I told him. "Really? Are you serious?" He asked in total surprise. "Yeah, I was really surprised, too!" I laughed as I helped to unload the hay from the back of the ute. "How do ya think you're gong to find his owner?" Tom asked not seeming to lose intrest. "I thought about asking around in school." I said as Tom stepped into his ute. "Sounds like a good idea to me!" Tom enthused. "Well, I'll see ya in a week or so!" He waved. "See you soon!" I waved back. "Hey, Destiny!" I greeted my horse as I leaned over the fence. "So Destiny, I'm ready for a ride. What about you?" But I didn't even wait for an answer. First, I lead her into the barn, fitted her bridle and since I was riding bare back, I grabbed a handful of mane and swung my leg over her back. Then I rode Destiny into our sand arena for a quick warm up. After that, we headed out to the pasture and headed to the gate that lead to the trails. I rode on trail for about an hour and when we got back I set up a few jumps. I LOVED the feeling of jumping. Bare back included. "This is awesome!" I thought to myself as I finished a clear round of jumping. When I did the high jumps, I could feel Destiny's muscles bulge with power under me. Please comment if you want part 4! I really hope you will enjoy the rest which I'm still writing! I will try to post part 3 next week! I'm really glad you all like my story! This is a really cool story, it sounds kind of like Winnie the Horse Gentler. Really good! God gave you a lot of talent. Thanks everyone!! I'm so glad you all like it! I really enjoyed writing it! And I am working on part 3! Thanks so much AhorseLovingGirl! I am working on part 3 (it will be written in the comments)! Wow, I agree with AHorseLovingGirl, you DO sound like Winnie the Horse Gentler! Also I love your story. Hey hoofbeats!! This DOES remind me of Winnie the Horse Gentler and I love it! It is so good hoofbeats, you are so talented! I'm glad you posted the story you told me about! I need to read part three!